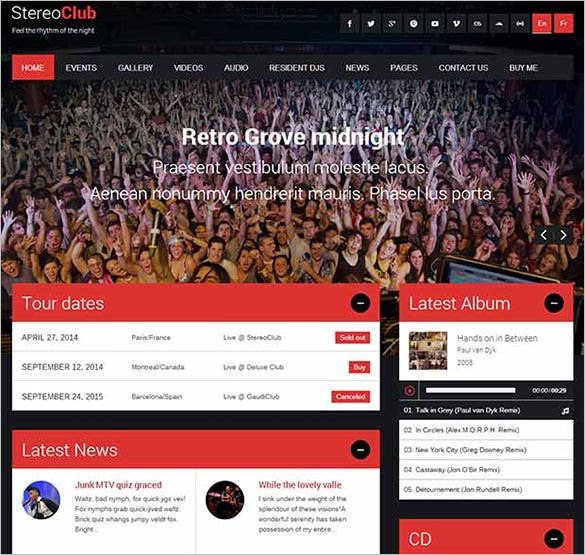 Music agencies, bands, event organizers, artists, and even music hobbyists can leverage the reach of Internet best with the aid of premium music website templates.Right from sharing studio jamming session audio’s with fans to communicating upcoming event schedules through widget calendars and other functions, contemporary premium Music website templates are fully loaded and empowered. 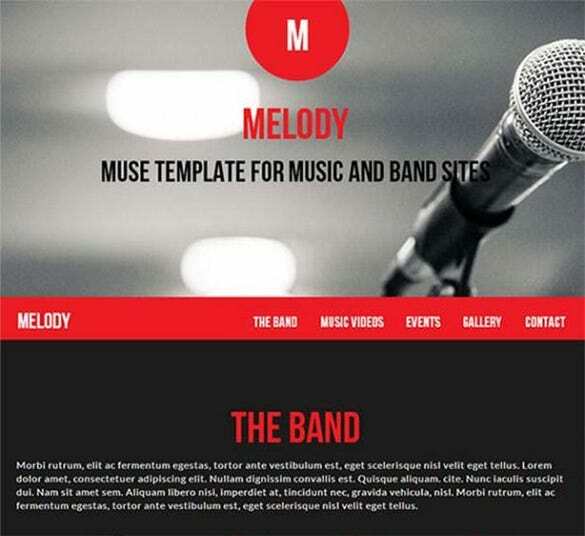 We’ve collected some of the best in class and top rated HTML5 and CSS3 ready website templates for you, which you can depend on for differentiated presentation. 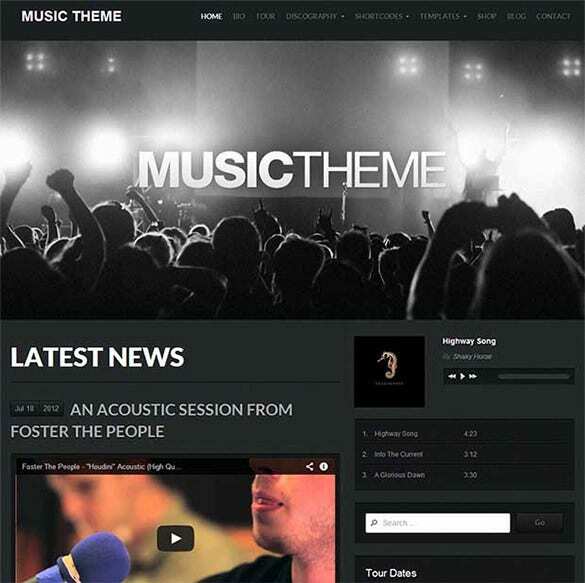 You can also see Music WordPress Themes. 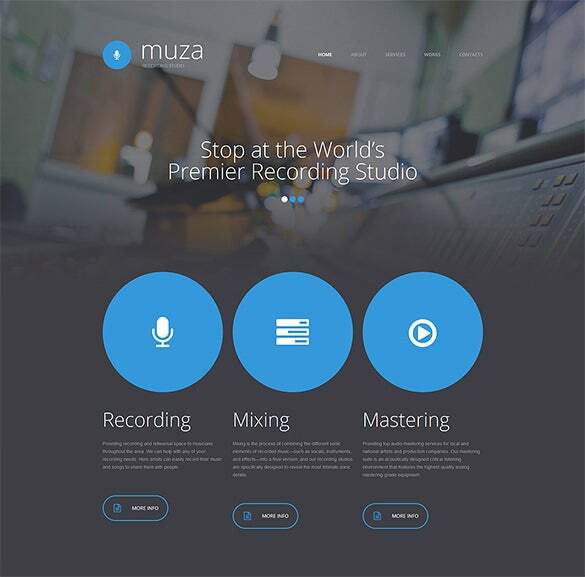 Recording Music Studio Responsive Website Template is a highly compatible theme with typekit fonts and motion navigation along with user friendly interface. 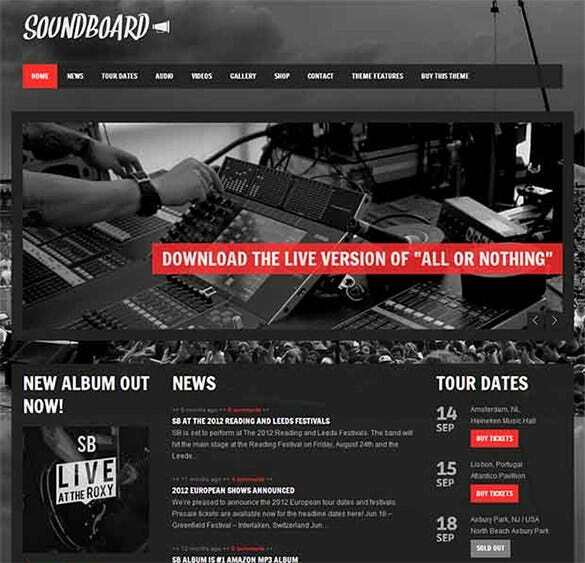 A fully responsive layout with multiple colour schemes and pre-defined colour sets make it more resourceful. 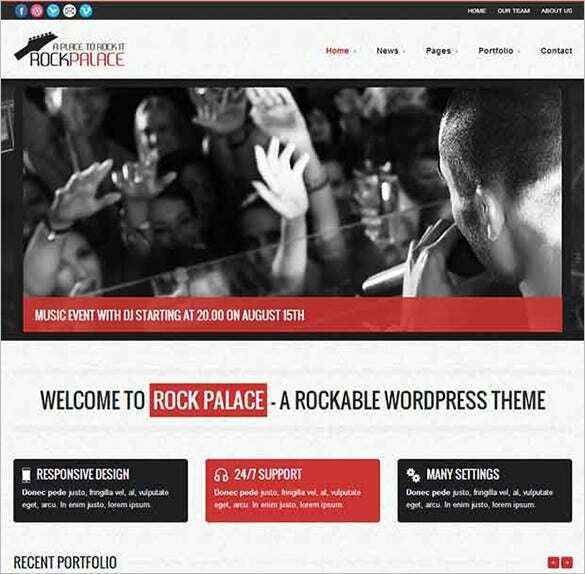 Usable shortcodes, fully responsive layout, multiple colour schemes, awesome icons, cross browser compatibility, bootstrap based framework – name it and you will find the feature with Rockit Music Band WordPress Website Theme. 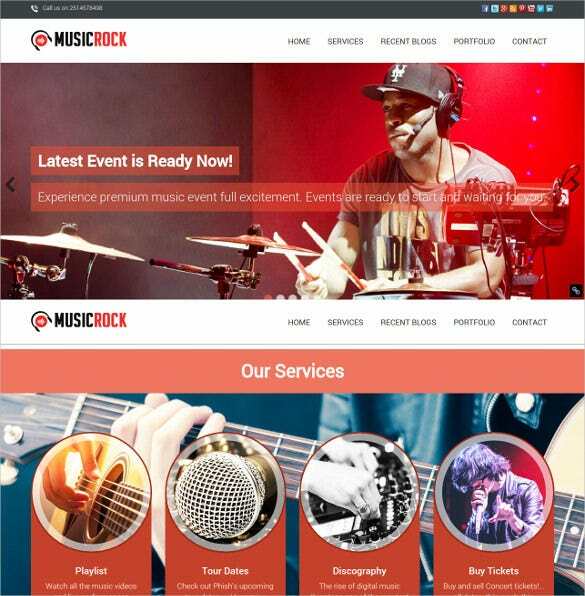 Featured with a lot of cool features like retina ready design, built-in MP3 Player, responsive layout like grid, column etc., layered PSD files, Music Portal Responsive Website Template is ideal to create a resourceful and exclusive website. 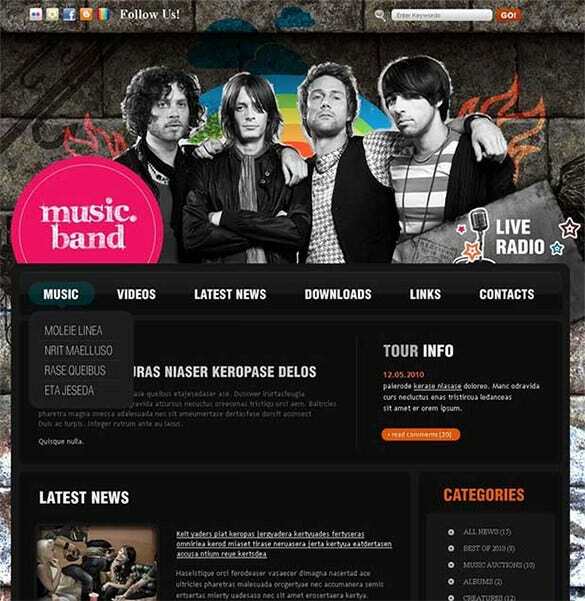 Make your online presence count with Spikes Music Band WordPress Website Theme. 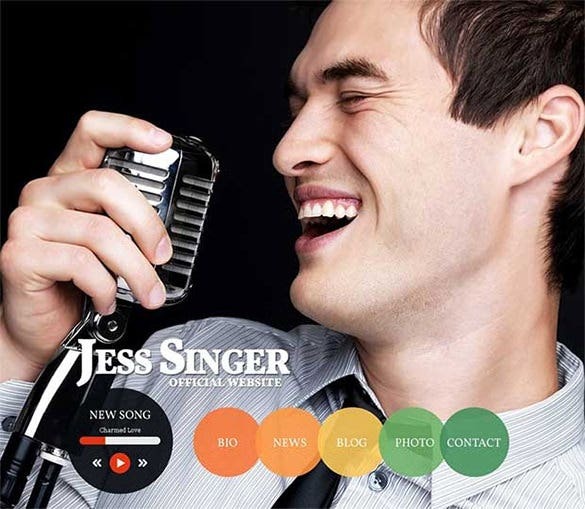 Widget facilitates, easy installation and customisation facilities, exciting sliders, Ajax contact form makes it one of the finest theme for designing a musical website. 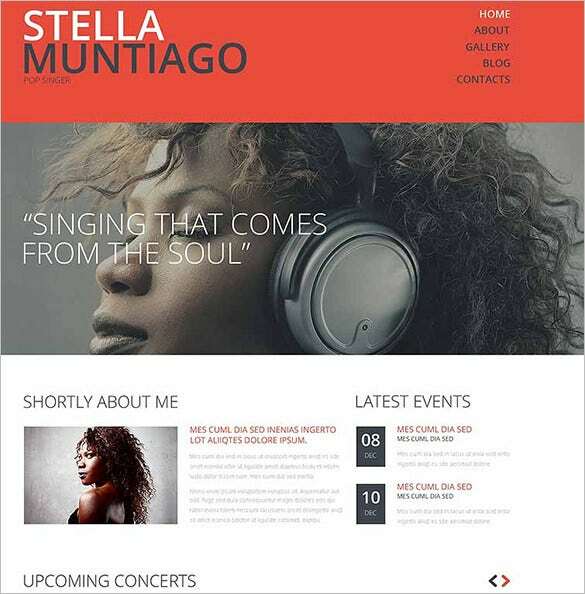 To build one of the most vibrant hues while making a fully responsive layout, Music Composer Portfolio Website Template is a perfect option. In addition, it also has multiple colour schemes, CSS compatibility, social medial integration, cross-browser compatibility. 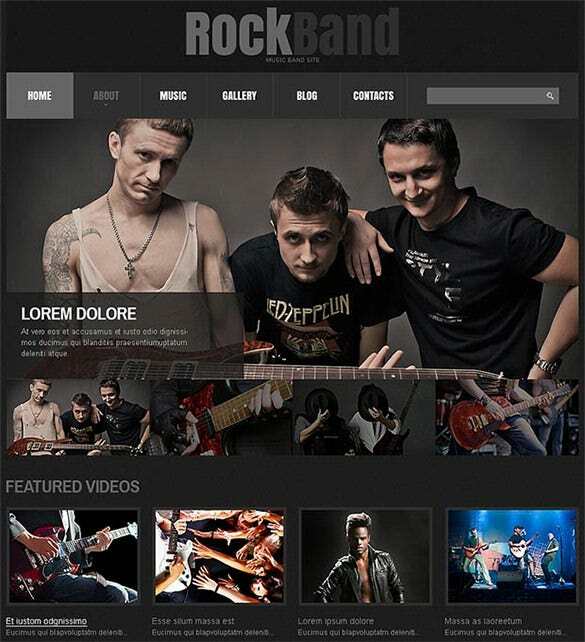 A multipurpose theme meant for the musicians which provides a retina ready interface besides multiple layouts to choose from. Management panels are available whereas the fully responsive layout makes designing fun. Unlimited colors are supported in addition to the parallax effect and useful shortcodes for the designers. 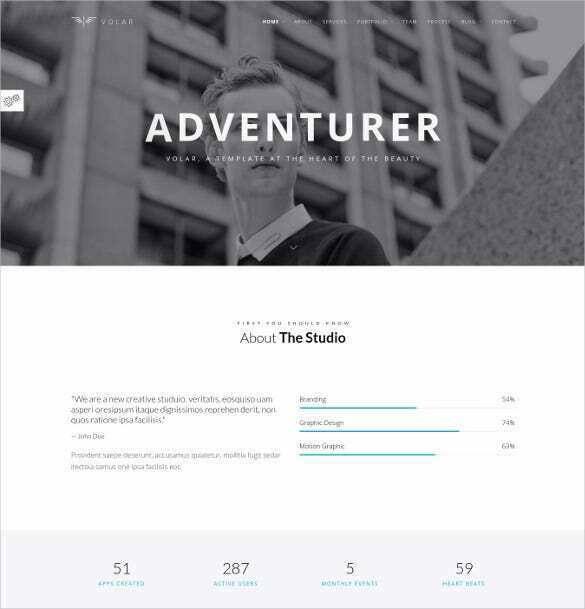 A responsive interface is sported besides custom post types and an options panel supporting multiple themes. 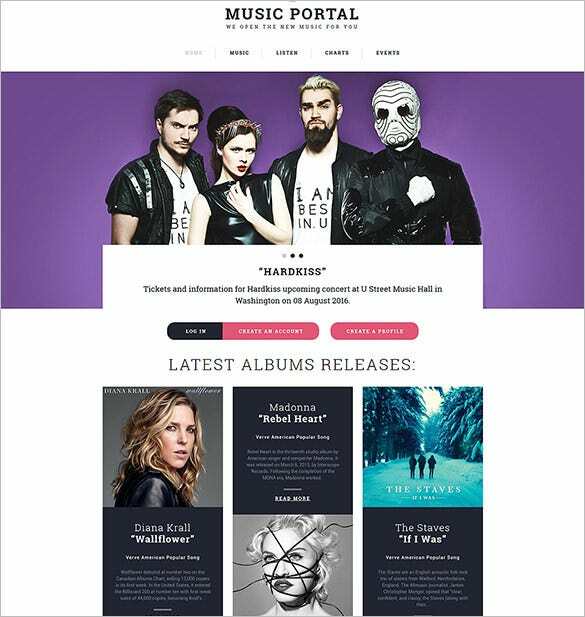 This is a one page theme which includes a fully responsive layout in addition to the built-in audio player for the musicians. Translation ready interface is available besides the filterable portfolio and a well-documented approach. A fully responsive layout which includes certain well-etched marketing norms in addition to the SEO optimization! Seamless hosting plans are supported whereas the one click feature comes in real handy for the professionals. 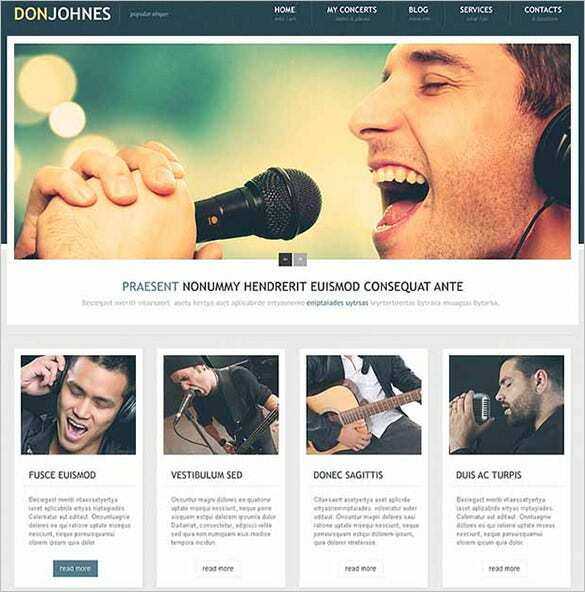 A theme for the aspiring musicians which provides custom post types and a built-in audio player! Powerful theme settings are up for grabs in addition to the localization support and the cross browser compatibility. 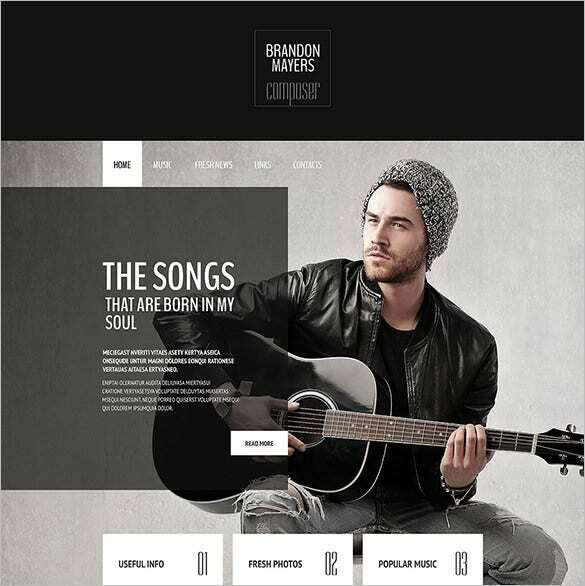 Make music promotions fun with this exciting theme featuring a responsive framework and a built-in audio player. WooCommerce compatibility comes in real handy for the professionals whereas the customizable options provide the needed flexibility. 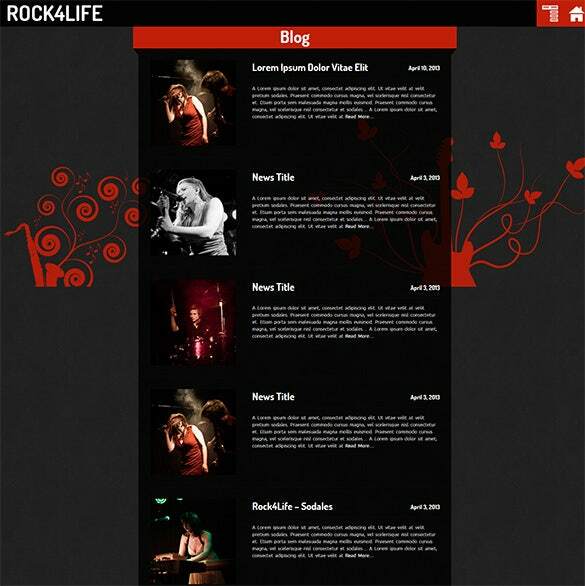 Both HTML and Joomla versions are available besides the Flickr feed widget which allows seamless installations. Cross browser compatibility and the translation ready interface make this theme an extremely resourceful one. 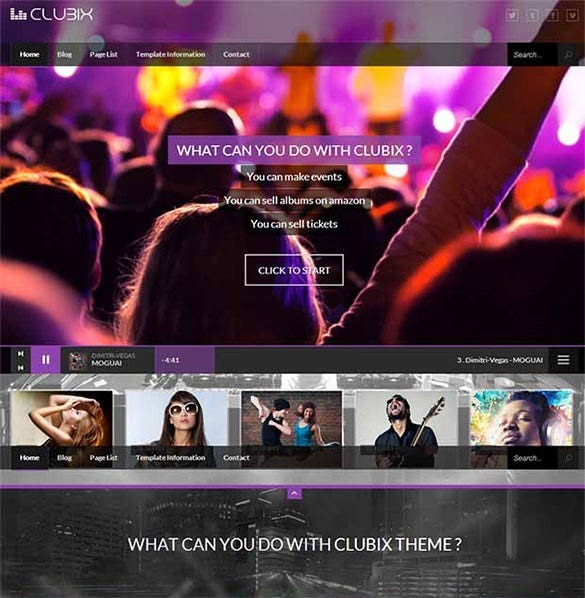 A resourceful theme which supports multiple color schemes besides a fully responsive layout for the designers. Stock photos and an extended imagery support are available besides functional shortcodes and an editable interface. Unlimited Google fonts are up for grabs in addition to the extended color variations and featured icons. Navigation is made easy with the Nivo and Revolution sliders whereas the extended admin panel provides the needed flexibility. 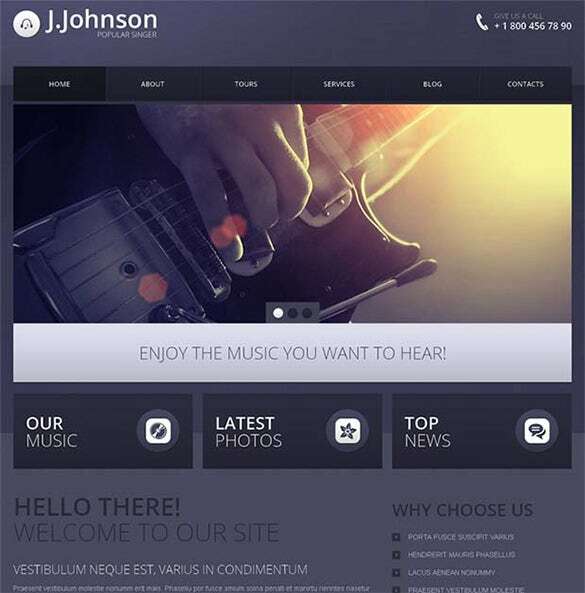 Get the most stylized theme for your musical website with fancy animations and a highly responsive design. Video support provides the needed boost whereas the 3 slideshows make room for an innovative installation. Bootstrap empowered admin panel and a responsive design make this theme an instant hit among the professionals. Multiple color schemes are also available in addition to the Photoshop PSD files. 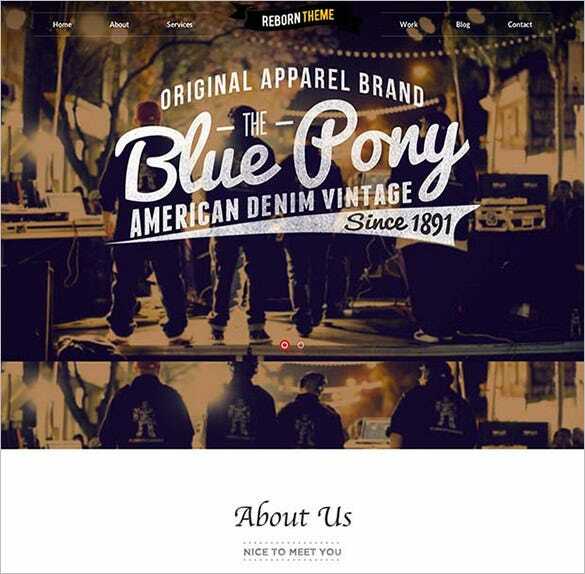 This theme provides a retina ready design which can be well teamed up with the responsive layout of the same. A built-in theme customizer provides the needed boost besides the translation ready framework. This theme includes a dual slider for seamless navigation whereas the Facebook integration makes it more resourceful. Countless custom widgets are included whereas the Google Maps provide the professionals with added flexibility. An aesthetically rich theme which includes unlimited colors and a translation ready interface! Dates and events can be effectively managed on using the extensive admin panel whereas the 500+ Google Fonts come in real handy. 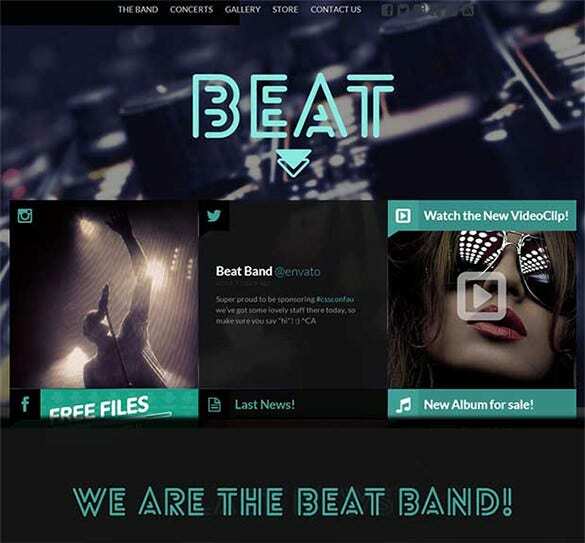 Step up to the beat with this exciting theme featuring a built-in audio player and 8 custom widgets. 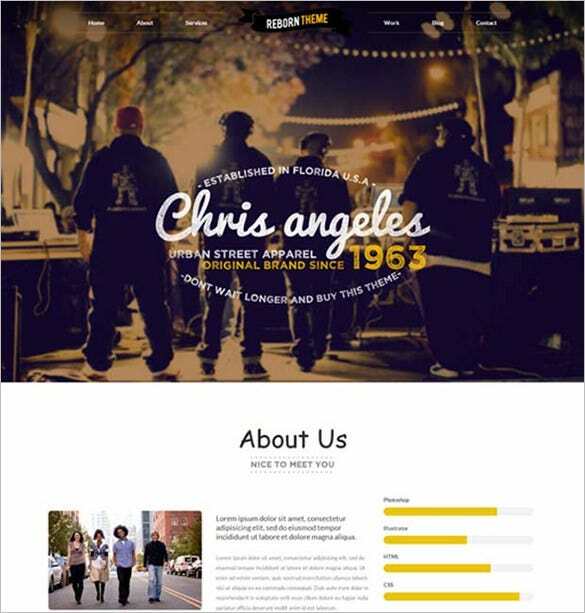 Styling variations are extremely desirable whereas the responsive layout includes custom post types. 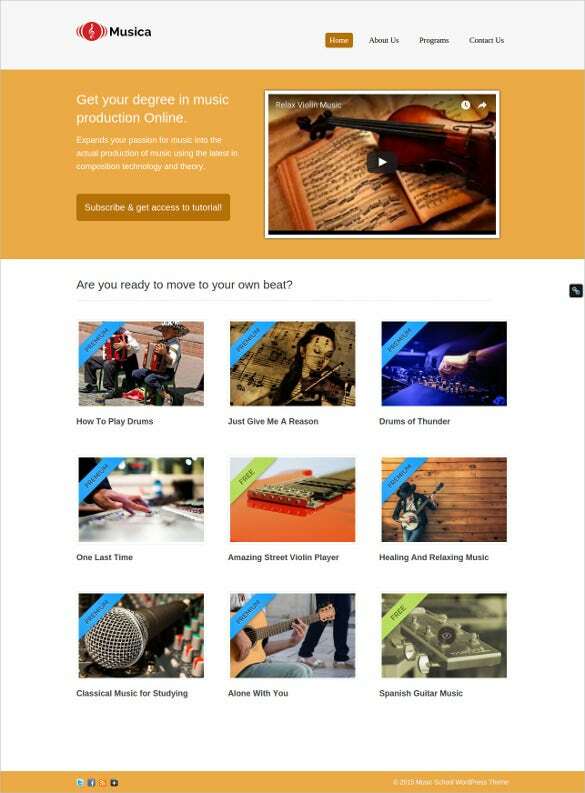 Set up the musical website perfectly with this innovative theme including stock photos and round the clock customer support. A responsive layout is available besides multiple color schemes for the professionals to choose from. A responsive theme which features a full gamut in a fully editable interface besides 80+ usable shortcodes! Custom post types are included whereas the SEO optimized approach comes in real handy. A drag and drop page builder is included for making the pages come to life in addition to the translation ready interface. 400+ Google Fonts provide the needed flexibility whereas the different header options are also available. 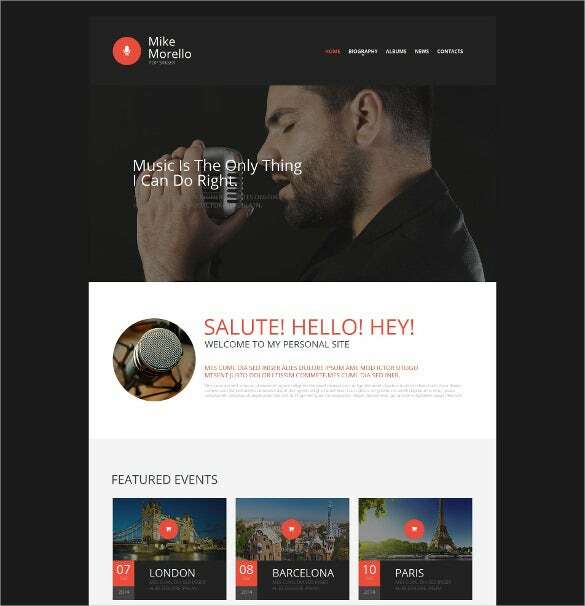 Meant for the music business this theme includes multiple tour schedules and 6 color themes for the professionals to choose from. The Widgetized homepage comes in real handy besides SoundCloud integration. 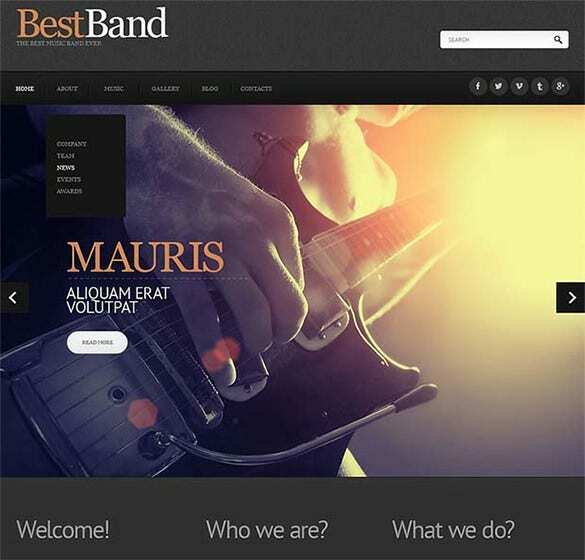 Play the music hard with this responsive theme which includes varied management schemes into the mix. Top notch coding schemes are included in addition to the multiple color schemes and custom post types. 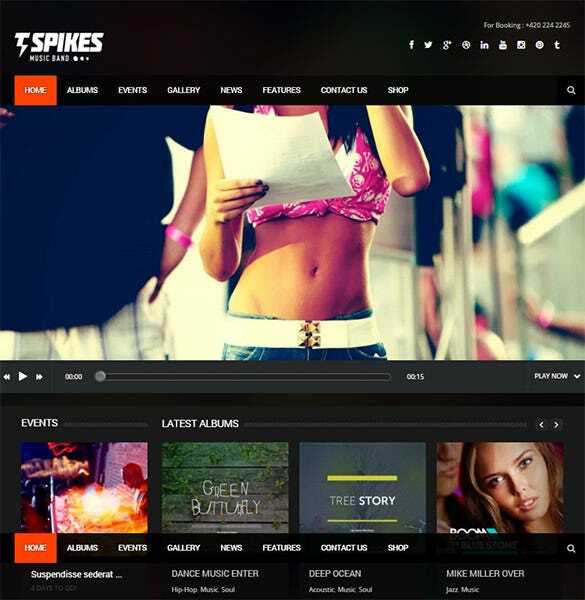 This is one versatile theme which allows handling multiple playlists and inclusion of scalable imagery into the mix. Perpetual updates are supported besides the complete localization support for the professionals. 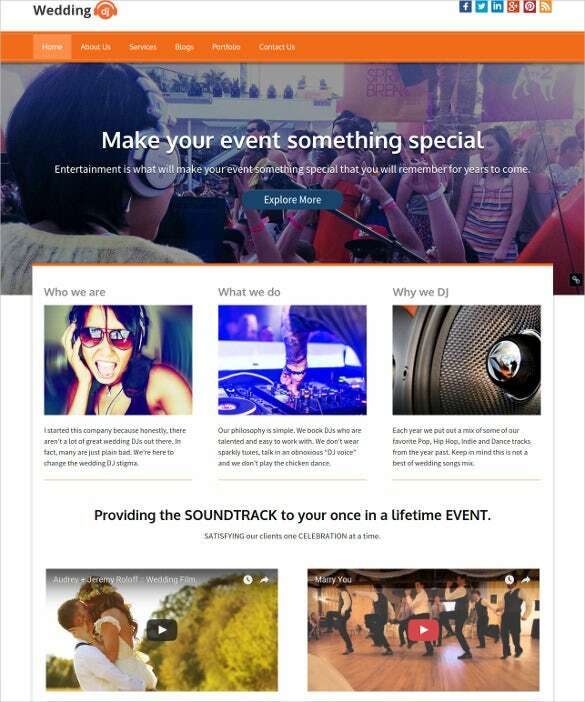 This theme includes a highly responsive layout which supports HTML coding in addition to the event management schemes. Audio and video management options are also featured besides multiple color schemes. 12 custom widgets are supported in addition to the embedded audio player which allows selective playlist handling. 5 custom post types are also up for grabs besides the completely responsive layout. 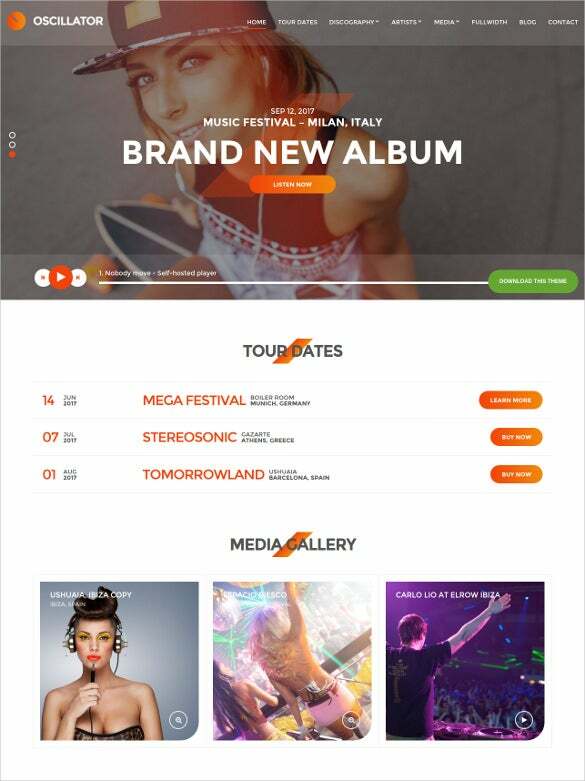 Retina ready designs and graphics are supported by this theme which also features the cross browser compatibility. 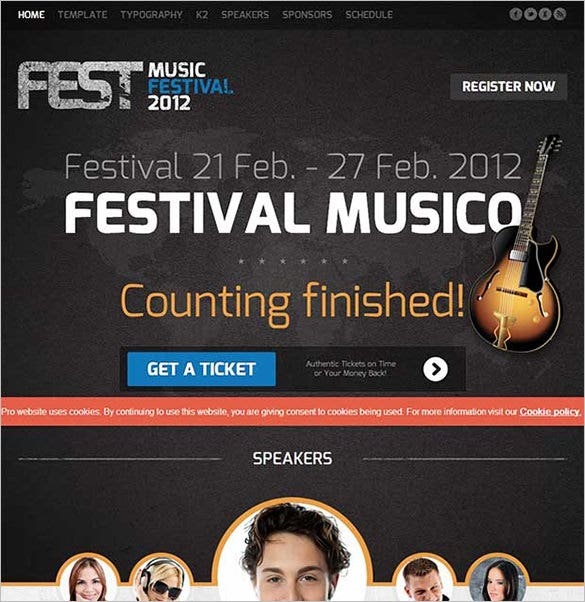 Two music players are embedded besides the one page theme set against a parallax backdrop. 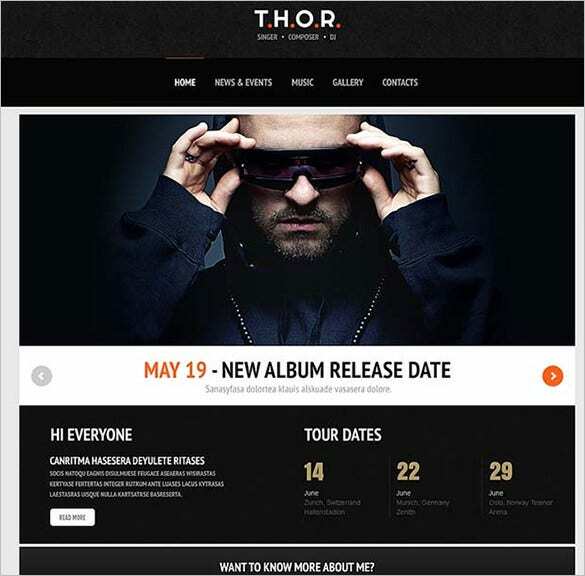 This theme features a drag and drop page builder in addition to the album management schemes and a responsive design. Translation ready interface is available for the professionals besides multiple color schemes. This one comes with a scalable container whereas the music player provides the oomph factor. Boxed and Full layouts are supported in addition to the embedded page builder for added flexibility. PSD files are included with complete HTML support besides a fully responsive layout. Bootstrap empowered widgets and templates are available in addition to the WooCommerce compatibility and multiple color schemes. WPML and translation ready interface is supported by this theme which also features an extended media gallery. Drag and Drop page builder skews up the functionality whereas the resourceful sliders make navigation considerably easy. This is one responsive theme which provides the multiple stock photos under the extended gallery in addition to the multiple color schemes. Round the clock customer service is available besides the sleek designs and featured font sets. This theme features a minimalistic design which also showcases multilingual support for the professionals. Blog and social medial integration come in handy besides the built-in SEO options and the cross browser compatibility. A template for celebrating the festive mood which includes live demonstrations and mobile compatibility! A responsive design is sported besides multiple color schemes whereas the CSS compatibility provides the added flexibility. 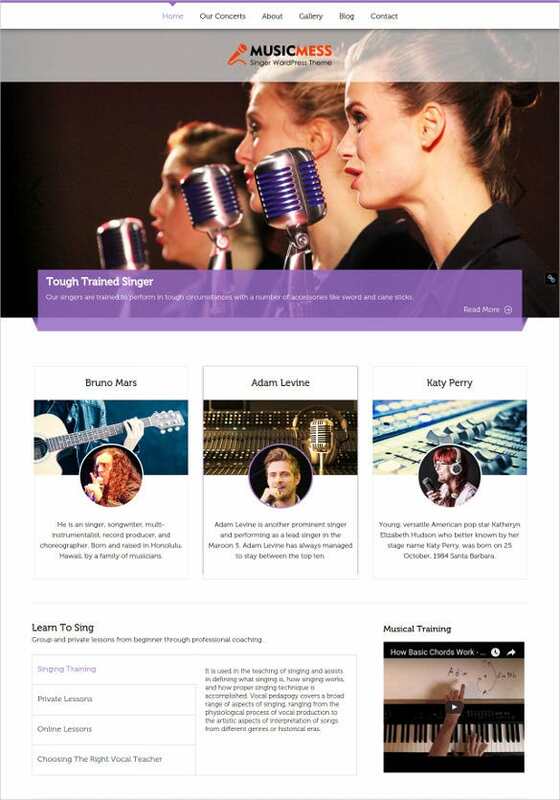 A vibrant theme which includes a sleek design for the budding musicians! Responsive layout and colorful options are included whereas the ready stock photos and round the clock service are some of the desired features. Meant for those talented individuals, this theme provides complete personalization followed by the availability of stock images. 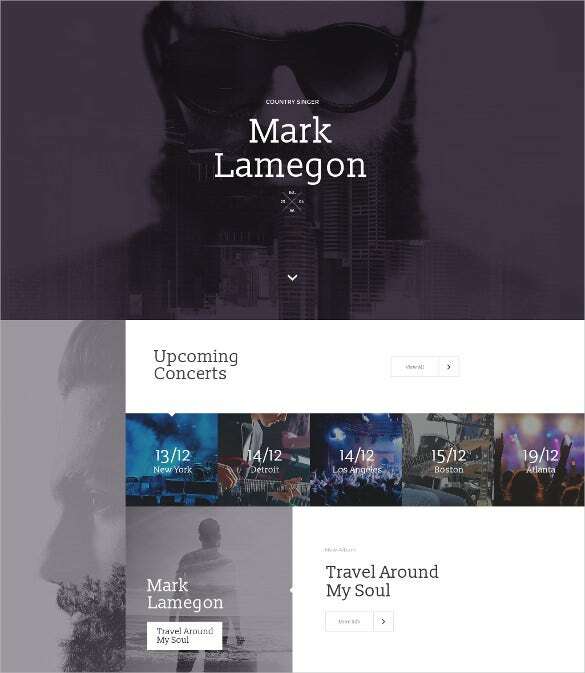 A fully responsive layout is showcased in addition to the multiple color schemes. This theme has some of the most vibrant hues included besides the round the clock customer service option. Complete customer satisfaction is guaranteed with the extended gallery and the fully responsive layout. 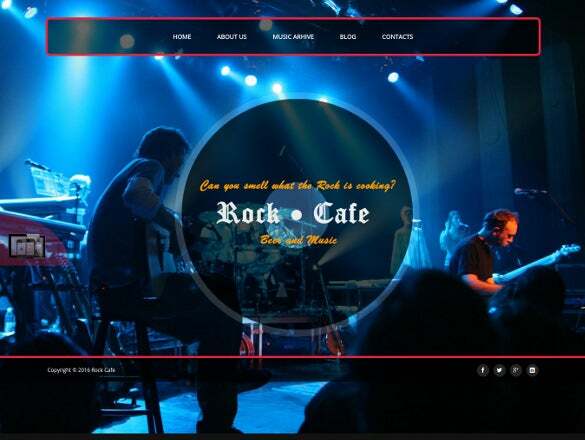 This theme has 25 HTML pages to boast of besides an embedded MP3 Player for the enthusiasts. 3 exciting sliders and the quickened portfolio add the required steam in addition to the Ajax contact form. 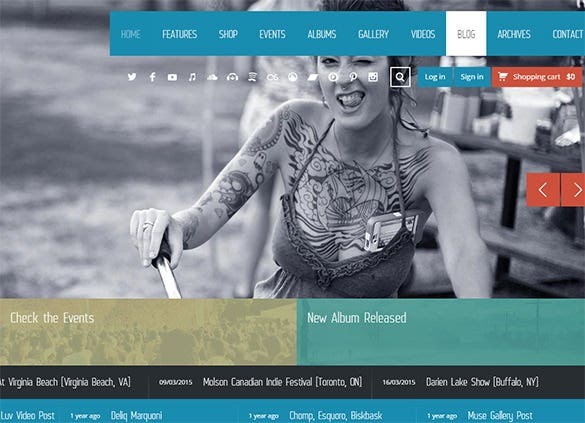 Set the standards real high with this innovative theme featuring the trendy grid style and better content management. The image show widget facilitates better personalization in addition to the built-in overlay. The retina ready design lends the added impetus whereas a built-in MP3 Player comes in real handy. Make room for the responsive layout which also includes a social feed grid besides the layered PSD files. This theme comes in multiple versions and includes an elegantly flat UI in addition to the fully customizable interface. 900 grid based layout serves the needful when teamed up with the premium Revolution slider. 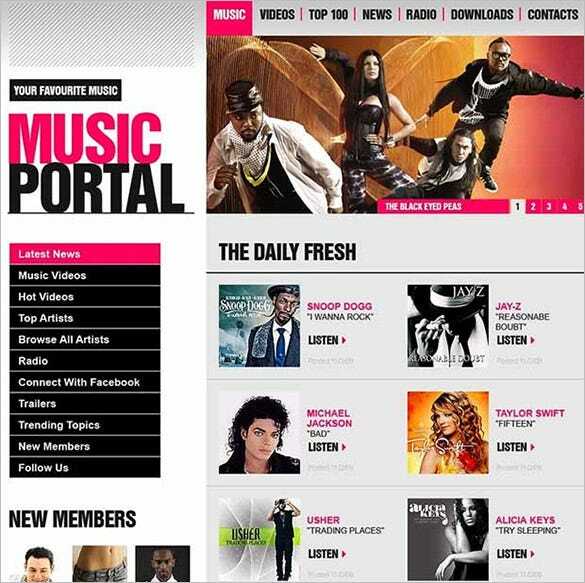 The fully responsive design packs a punch and delivers a vibrant yet minimalistic layout for the enthusiasts. Stock photos ad round the clock customer service are available in addition to the multiple color schemes. 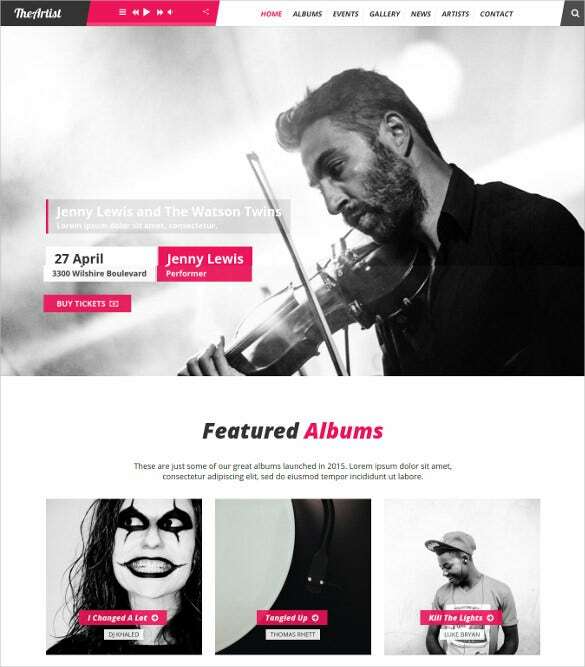 A powerful theme for the musicians which includes 19 HTML pages and a bootstrap grid design! 360+ font awesome icons are up for grabs in addition to the responsive layout and cross browser compatibility. 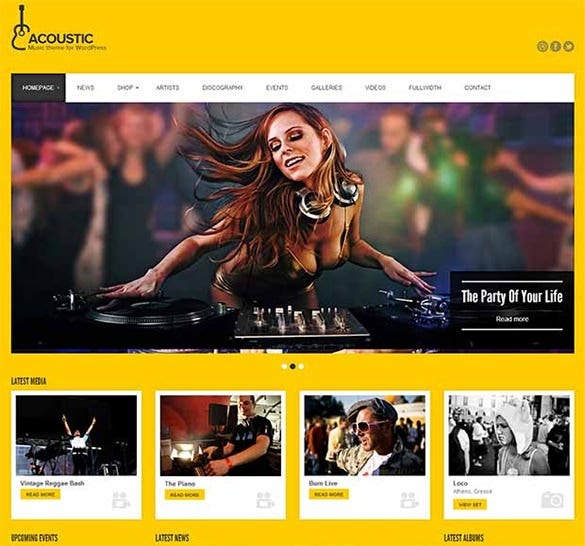 This theme has a fully responsive layout in addition to the editable interface which comes in real handy for the musicians. Usable shortcodes and stock photos are includes whereas the multiple color schemes make it more resourceful. A highly compatible theme which features Capacity Scrolling effects besides the lightbox video gallery. Availability of Typekit fonts and motion navigation make room for some added innovation followed by the user friendly interface. 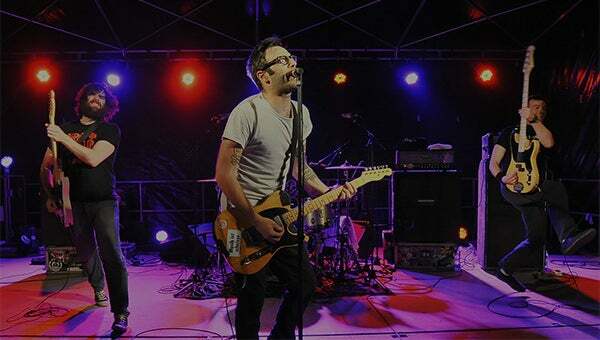 Set the chords straight with the responsive layout and 7 PSD files available for the designers. Custom post types and the management panels help transform the pages with seamless ease besides the WooCommerce support.